In Martial Arts there are various movements taught and some self-modified. Some focus more on the upper body movements- forward punches, uppercuts, elbows, etc. Whereas some pay more attention to the lower body movement- kicks. A kick can be deadly and can induce a K.O. (knockout) if the application is correctly carried out. The editor’s picks on top 5 deadly kicks. This kick can cause serious damage to the opponent if it lands on the correct part of the thigh. 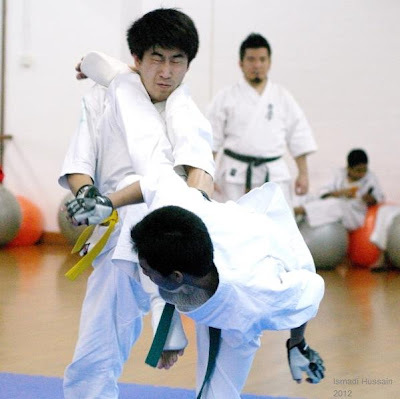 If you look at the below (credits to Azam), Hajime Kazumi applied the kick using his rear leg to the inner part of the thigh- just slightly above the inner side of the opponent’s knee where it has the least muscle and flesh. This kick means serious business and can cause excruciating pain. Definitely worthy to be on the list of top 5 deadly kicks. A pretty common kick as we see in tournaments nowadays. However, not everyone is flexible enough to deliver a smooth and accurate reverse roundhouse kick. Practice is needed to deliver a perfect application. It is a deadly kick because you could catch the opponent off-guard and send them into moment of shock, or it can be too strong for your opponent to fend it off. Either ways, it has a high probability of knocking your opponent out. Decorated kick that requires accuracy, power, and speed. With practice, this movement can be deadly because of the landing power or if your opponent is slow to fend it off or avoid. The body parts targeted by this kick are nose, temple and jaw. and the other is front rolling kick. Middle level roundhouse kick aka chudan mawashi-geri targets at where your opponent’s liver is. (Just in case you are wondering, our liver is located just below our right ribs.) It can send your opponent into moment of shock. The body would experience difficulties in breathing when the liver receives a deep impact. To deliver a good middle level roundhouse kick would require hard practice on the sandbag and the good rotation of your hips. Undeniably, this is a favourite kick amongst seasoned fighters. The Brazilian Kick tricks the opponent into putting up defenses in the wrong direction. Applying the same technique, there are 2 types of such kicks belonging to this family. In this youtube video, you can watch from 0.42 with slow motion replay at 0.50 to see how this kick was beautifully executed. Regardless of which kicks are your favourites or your signature movement, remember that it takes preparation, practice and hell lots of practice to perfect that movement. Posted on May 26, 2013 by admin. This entry was posted in Article. Bookmark the permalink.